As the presidential race heads into the home stretch, CBS News reporters are out on the road traveling with the Bush-Cheney and Kerry-Edwards campaigns. Day two of the Republican National Convention finds its nominee campaigning in Tennessee, Iowa and Pennsylvania. In Nashville, Mr. Bush addresses the American Legion National Convention Tuesday. It's a natural forum in which the president can portray himself as the best friend of veterans. A White House spokesman says Mr. Bush will also discuss the war on terrorism. On that issue, he made no effort Monday to clarify his remark in a "Today Show" interview that the war on terror cannot be won — even though he has said many times in the past that the U.S. and its allies would win it. He left it to his spokesman to clarify that Mr. Bush meant it's a different kind of war against an unconventional enemy. Press Secretary Scott McClellan said America should not expect a treaty to be signed or a formal surrender, as in other wars. But in his stump speech Monday in Taylor, Michigan, Mr. Bush again said the U.S. would "prevail" in the war on terror. Kerry's last chance at vacation actually is turning into more work than play, especially with a new change in his schedule which actually cuts his time off a bit early. The campaign announced that Kerry and his wife Teresa will leave Nantucket on Thursday night instead of Friday to attend a midnight post-Republican convention rally in Ohio with the Edwards. Then they'll all split up to campaign through the weekend and next week. Meantime, in between meetings with campaign manager Mary Beth Cahill (described as meetings about the debates and the campaign's fall plans), Kerry went windsurfing for the second day in a row but had a little trouble on the choppy water. During the hour he was out on the waves, he fell twice before switching sails and finally getting into a groove. Later he described the conditions as "too erratic" and "too up-and-down." Today, Kerry is expected to lay low, as heavy rain is predicted for Nantucket, before flying to Nashville for his speech to the American Legion's convention Wednesday. If his schedule doesn't slip, he will make remarks upon his arrival in Nashville at 10:45 p.m., timed perfectly to hit smack dab during the networks' live coverage of first lady Laura Bush's speech at the Republican convention. John Edwards did not sit on the sidelines on Monday, the first day of the Republican National Convention. Instead the senator gave a major policy speech focusing on national security and foreign relations to an auditorium filled with supporters at UNC-Wilmington and dozens of reporters and television cameras. "I know that there are some Americans who question whether there are differences between us and our opponents," Edwards began. 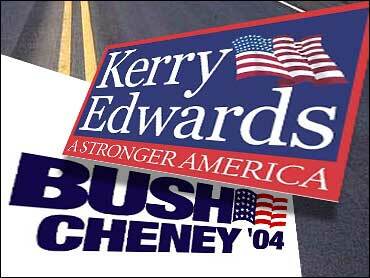 Over the course of his 35-minute speech, the vice-presidential candidate cited 12 examples of differences between Bush/Cheney and Kerry/Edwards on foreign policy, dotting his speech with some variation of, "This is what we will do, this is what they can't do and that is a difference." The senator then spent about an hour doing interviews with the media, grabbing some of the political spotlight fromt the Republicans clearly an objective. After the normal local news interviews, the campaign granted rare network interviews with each of the national media represented on the campaign plane, almost guaranteeing an Edwards sound bite on the evening news broadcasts. "I think it's an important time for people to see the differences; we're going to get a lot of happy rhetoric at the Republican Convention this week, but the truth is, this administration has a record," Edwards told CBS News, continuing with a laundry list of the Bush administration's perceived failures. The candidate then headed to West Virginia, where he dropped by Taramack, an arts and crafts center in Beckley. Edwards shook some hands, watched artisans at work, and bought some lunch (fried green tomato sandwich and peaches, but it's not clear that the senator actually indulged as he got it to go and the same food was spotted later at the hotel with an aide). Edwards holds a front porch visit in Beckley Tuesday, where he is expected to talk about Bush's "miscalculations" on the economy. If you watch the convention coverage this week you'll no doubt see plenty of Vice President Cheney, as he will be in Madison Square Garden each night to watch the various speeches. But don't be surprised if you don't actually hear from him until he takes the stage on Wednesday night to deliver his address. Besides his event on Ellis Island on Sunday and a dinner speech on Thursday, the vice president has no public speaking events for the five days he's in New York. He'll spend the week preparing for Wednesday and meeting privately with supporters. But that doesn't mean that all the Cheneys are keeping quiet. At an event title "W Stands for Women" on Monday, the vice president's wife Lynne and daughter Liz joined several ranking women in President Bush's family in a series of speeches and policy discussions relating to women's issues throughout the world. Both Lynne and Liz have played prominent roles in the vice president's campaign this summer. Liz has introduced both her parents at several events and is often seen wrangling her own young daughters, especially if they have joined their grandparents on stage. But the event on Monday was for grown-ups only. The Cheneys sat across the stage from former first lady Barbara Bush and the president's sister Doro Bush Koch. George Bush's twin daughters, Barbara and Jenna, were also on stage but did not speak. Liz Cheney thanked the Bush family for all the hard work they had done for the country and especially the president himself. "I believe that President Bush has done and is doing more to empower women all across the world and in our very own country than any other American president," she said. Lynne Cheney's speech was similar in message and tone to those she gives when introducing her husband on the campaign trail. The president's action and policies have made the world safer and a much better safer for women and children. But it wasn't all seriousness. The president's mother Barbara treated the audience with stories about her husband George H.W. Bush and their recent trip to the Olympics, saying he was upset that skydiving was not an event and she wouldn't let him demonstrate his strength to the weightlifting team. She also took some shots at her granddaughter's reputation as party girls. Referring to daughter-in-law Laura, she said, "She seems to manage everything and everybody, including her husband and her mother-in-law with grace and style and humor." Then she pointed to the twins. "She hasn't quite made it yet with two you-know-who's over here."